I’m going to link to a Dutch price comparison website for most items. In Q2/Q3 2019 AMD will release newer Ryzen CPU’s. I stopped caring about getting the latest each time. This memory arrives without a heat sink. I bought 2 types of heat sinks from AliExpress. They’re still to arrive so haven’t listed them yet. A heat sink might not be needed but I rather be careful. I bought this for 42.50 EUR incl shipping, current price is way higher. You’ll probable want to search around for better prices. I wasn’t sure if to get 150 Watt or the 120 Watt version. I noticed some people reporting stability problems with 120 Watt, though that could be due to heat instead of power. The integrated GPU can be power hungry; I doubt I’ll ever use something GPU intense. This is significantly cheaper on Amazon UK than Amazon DE. For me the UK one came with a EU power outlet and was sent quickly from Germany. I was expecting to get a UK power outlet and then use a spare ‘monitor’ cable to make it work. Use keepa.com plugin for your browser to compare the prices across Amazon sites. Amazon was cheaper than any price comparison site. This bit hasn’t arrived yet. I added this to ensure there is more space between the memory and the pico psu (both sources of heat). Further, the internal USB3 cable from the case is very sturdy. Turning the pico psu 90 degrees will help with that internal USB3 cable, plus optimize heat dissipation. Similar to the ATX 90 degree adapter. This is solely meant for making it easier to connect that sturdy internal USB3 cable. I wanted this due to remarks that a M.2 SSD could run quite hot, combined with the lack of airflow in the case (as it’s fanless). It’s only a few EUR and I wanted to be on the safe side. Note: It’s tiny! Despite being for M.2 it’s smaller (5cm wide) than expected. I’m still not entirely sure if it’s needed. The power supply and the pico psu/DC-DC converter aren’t 100% efficient. Meaning, 150 Watt from the power supply will be less when it arrives at the pico psu. Same for when it arrives in the mother board. On the other hand, power supplies are really inefficient if they’re underutilized. Meaning, if you only run it at 50% performance the power supply and convertor will waste a lot of power. Make sure to pay attention that the voltages are all ok. Meaning: that everything accepts the same voltage (12 or 19 Volts seems to be common). AliExpress and Ebay have a lot of questionable Pico PSU/DC-DC converters. They’re cheap, but the reviews made me question buying those. I noticed a lot of sites reselling the AliExpress ones under various brands. Make sure to recognize those AliExpress ones. See for instance the ones sold by RGeek store. I bought 20 grams of thermal paste due to a) better heat transfer than the one which came with the case b) a comment that there isn’t enough thermal paste with the case. The case came with (I think) 2x 10 grams. I’m pretty sure 8 grams would be enough and I applied it generously. If you get a less power hungry CPU then stick with the one from the case; it’s pretty good as well from reading the specification. Spec showed 5W/m.K, the one I have is around 8.5W/m.K. The Dutch Tweakers.net site allows you to add multiple products and then calculate the cheapest combination of shops including shipping costs (probably only works for .nl, .be). It also gives alternative shop combinations. Fanless NUC cases: Akasa, they also have nice options for motherboards for Intel CPU’s (seems most of those motherboard have a fixed layout). I wanted the pc to be small. My NUC is tiny, the new pc is still huge in comparison. You’re paying a significant premium to have use small components. If you do not go for mini-ITX sized motherboard you can save a lot on the motherboard. Same for the fanless case, it’s also possible to use a quiet CPU cooler (e.g. Noctua NH-L9a-AM4). The fanless case plus PSU and so on was 200 EUR. There’s cases for 40-50 EUR including PSU. Yes, please give us the full list of components! I tried posting it as a comment, but all my HTML kept getting removed. I’ve resorted to adding it in the post in a “more” section. I’m interested in what is this fanless case. So you have a 5.1 sound system and no problem with it on Linux? I ask because I transformed my old PC with an old old AMD graphics card to an HTPC. I connected the GPU to my A/V receiver through HDMI and I can’t have 5.1… I can only have wither stereo, or mono on all the speakers. I searched for hours how to change the PulseAudio config file, but I couldn’t have a proper 5.1. If you have absolutely no problem, I’m starting to think that maybe it’s a problem with my GPU… maybe it’s too old..
My audio setup is a Logitech Z906, it only has analog input cables, no HDMI in/out. I had to add “default-sample-channels = 6” to /etc/pulse/daemon.conf, though you could also do this within your home directory somewhere. Pulseaudio is integrated into the GNOME control center / “Settings”. The NUC had only digital out and HDMI out. The digital out made popping sounds (never was able to fix that). So for the NUC I bought some 30 EUR USB 7.2 soundcard to be able to connect analog audio cables. 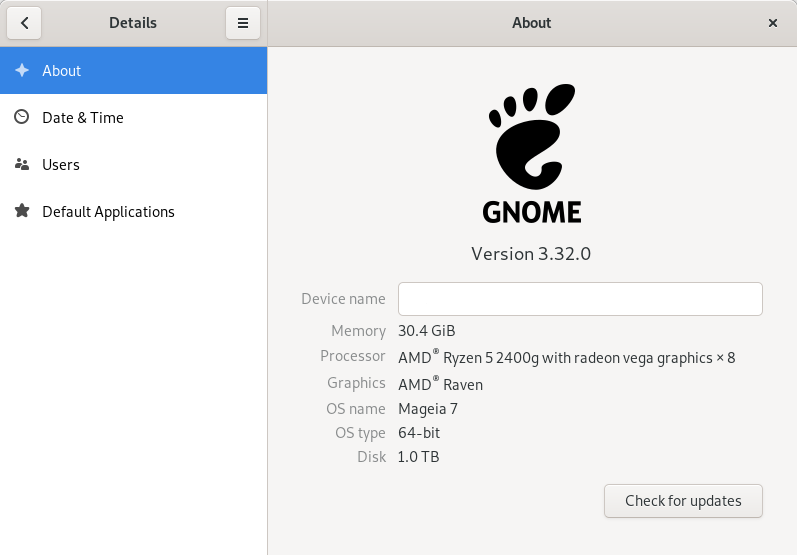 After that I had to choose the correct output within GNOME Settings. I used this for many years without too much issues. The downside of an external USB soundcard: I sometimes accidentally put pressure on the USB cable which then caused hard to figure out issues while playing video. Once I switched to my new pc I disconnected the USB soundcard from the NUC. It worked after a) I added “default-sample-channels = 6” to /etc/pulse/daemon.conf b) connected the cables c) I logged in again a few times (might not be needed). I saw some posts that you do not need to change the config anymore so maybe it was just a case of actually connecting cables.. but once it worked I didn’t care anymore. I’m not home and forgot if my new pc does HDMI out. My new pc does 5.1 correctly.